As I reflect on all that has happened this year, the two words that come to mind are preparation and presence (but with an emphasis particularly on presence). Other than the preparing for the most important day of my life throughout the first half of the year, there were and remain other things from the second part of the year where I felt like I was constantly in motion–ministry event after event, and, of course I must mention–the impending birth of my son, among other things. While today is the 7th Day of the Christmas Octave, the preparatory season of Advent is actually still very much alive in my heart; the Lord really had me dig deeper in understanding the season of preparation in a whole new light as it pertains to my life currently. Of course there were stressful times leading up to big life-changing events. My intent behind being my overly organized self the month of the wedding was so that I could spend the last few weeks being present with my then-fiance, family, friends, and Jesus. 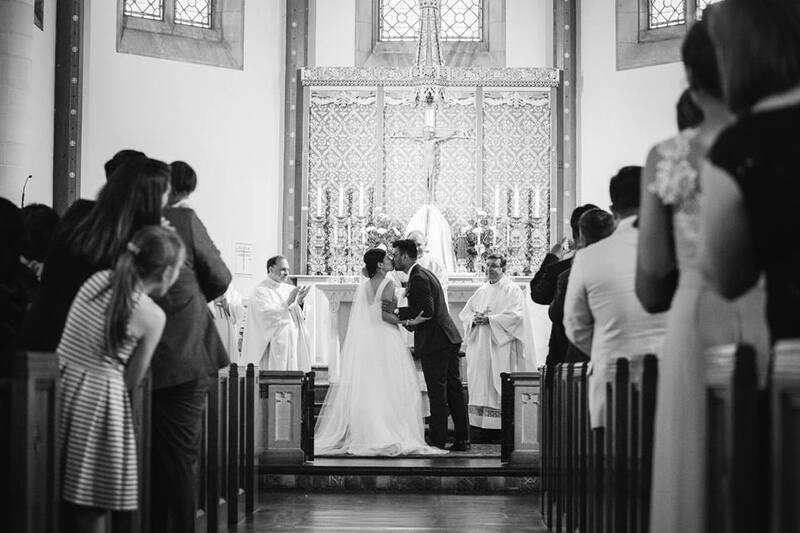 Granted, my type a personality and the perfectionist that I am as a designer got in the way, but at least at the very end (literally the night before), I was able to spend time with my now-husband, family, friends, and Jesus in the Blessed Sacrament the night before the wedding. We’ve been married 7 months now (how crazy is that?) and each day is a new learning experience, which I have come to really love and embrace. It’s difficult, yes, but oh so fruitful and humbling. My pregnancy with our son has been an incredible journey thus far. We’ve got two months left – we’re on the homestretch, baby! Despite all the oh so wonderful and fun symptoms that come with being pregnant (I say that with and without sarcasm), the amazing little life growing inside my womb has reminded me every single day of the miracle God has blessed us with. It also allowed me to grow even closer to the Blessed Mother, especially this past Advent, as I continually pray to model after her. As the Mother of God we tend to think that she is so far from us, high above us, but really she was a humble handmaid who remained faithful to the Lord her entire life. I’ve had and continue to have beautiful reflections of her bearing Christ in her womb, birthing him, and raising him. While my husband and I have many tasks that have yet to be done in preparation for our little guy’s arrival, the attitude I’ve taken on this year with being present has been a great blessing. Each day I ensure that we enjoy the quality time we have with each other, our family, friends, and again, the Lord. In fact, one of our Advent daily reflection was all on being vs. doing. That all the more affirmed what God has continued to share with me in prayer. It really could not have come at a better time. Presence, truly, is key – with each other, family and friends, and God above all. 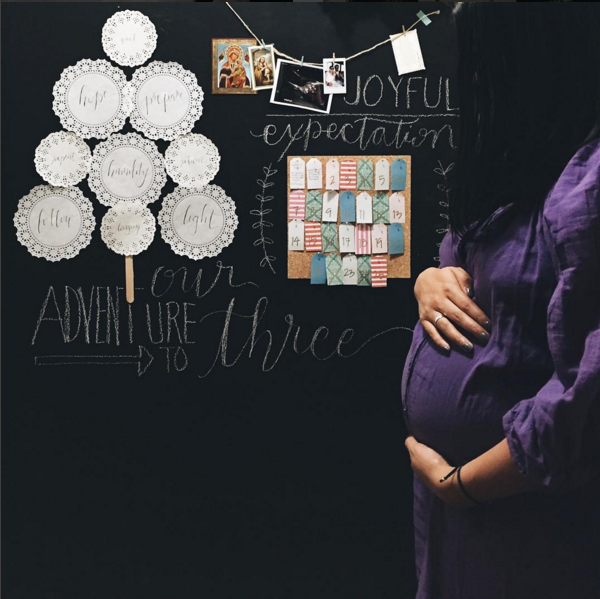 As a high school campus minister, I feel as if my life is inundated with constant tasks – or maybe it’s a teeny bit more difficult because I’m pregnant (so, basically, always exhausted though I have random spurts of energy, shortage of breath, heartburn, swollen feet and hands, etc. Don’t worry, I’m getting better at understanding my limits!). Really, though, I don’t think God has stretched me as much as He has this fall semester. While there were what seemed like endless lists of tasks at hand, I would be reminded again of the importance of my presence to my students and even to my colleagues – that whenever throughout the school day a student or colleague came to my office, I would willingly invite them in and give my full attention to them, asking how they are doing outside of the school world all the way to talking about family crises or difficulties with themselves. A few weeks ago, a great moment of joy in ministry occurred when one of my students, who is going through a lot right now, came to my office to decompress. She had already been coming in regularly to talk, but this time I felt nudged by the Holy Spirit to ask if she wanted to go to the Chapel with me. I knew the best option that day, to pray in front of the Lord in the tabernacle because truly, He was and is the only one who could really lift the burdens from our shoulders and heal us, heal her. It was such a beautiful moment because while sitting before the Lord I remembered how desperately we are in need of Him, and His presence alone has the ability to give us the unwavering peace we need during times of uncertainty, fear, or anxiety. I can’t stress how grateful I am that the Holy Father has called forth the Holy Year of Mercy for our Church. We all know how much in need our world is of it, I know how much I, myself, am in need of it every day. 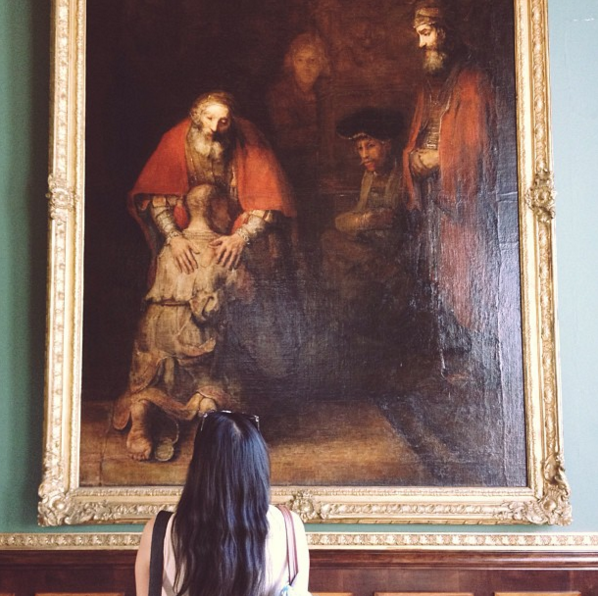 When it comes to mercy, there are a handful of images from Scripture that quickly come to mind, but the one that has always been so dear to my heart is that of the Return of the Prodigal Son or the Parable of the Two Sons. I attended an Advent Day of Reflection earlier this month and the speaker reminded me of something about this parable that really opened my heart so wide this season. After a few days, the younger son collected all his belongings and set off to a distant country where he squandered his inheritance on a life of dissipation. When he had freely spent everything, a severe famine struck that country, and he found himself in dire need. So he hired himself out to one of the local citizens who sent him to his farm to tend the swine. And he longed to eat his fill of the pods on which the swine fed, but nobody gave him any. So he got up and went back to his father.While he was still a long way off, his father caught sight of him, and was filled with compassion. He ran to his son, embraced him and kissed him. His son said to him, ‘Father, I have sinned against heaven and against you; I no longer deserve to be called your son.’ But his father ordered his servants, ‘Quickly bring the finest robe and put it on him; put a ring on his finger and sandals on his feet. Take the fattened calf and slaughter it. Then let us celebrate with a feast, because this son of mine was dead, and has come to life again; he was lost, and has been found.’ Then the celebration began. Now the older son had been out in the field and, on his way back, as he neared the house, he heard the sound of music and dancing. He called one of the servants and asked what this might mean. The servant said to him, ‘Your brother has returned and your father has slaughtered the fattened calf because he has him back safe and sound.’ He became angry, and when he refused to enter the house, his father came out and pleaded with him. As you have just read, the elder son, who worked for his father in his house the whole time while his younger brother was throwing his life away, was so bewildered. How could his father throw a celebration giving the son who disobeyed him a grand ol’ celebration and the best of what his father had? If the elder son had only been present to his father throughout the entire time he was under his roof, then he would have been able to understand why his father was so moved with compassion toward the lost son asking for mercy. And instead of being so angered at the fact that they were all celebrating the return of the son who threw his life away then asked his father for forgiveness, then he also would have rejoiced as his father did was or would have at least shown compassion to welcome him home. We may find that our actions reflect that of the older son, or even the lost son, but what we are all to be striving for is light enough to see through the father’s face in the painting. Presence shapes us, gives us new perspectives, an understanding we may not have had before. So with that: farewell, 2015. My prayer and hope for 2016, in this Year of Mercy, is to continue to be present – present among my loved ones, the ones I struggle with; present among the sick, the poor, the outcast, the lonely and suffering; but above all, present before the Lord whose abounding mercy is truly what I know I am in need of, and what the world is in need of. The only way we can show mercy is if we know what, or rather Who, mercy is. Cheers, 2015 – the best year of my life so far! And cheers to all the blessings that are in store in 2016! May God bless us all.